New Technology And Conference Update! Whew! I had a whirlwind trip to Las Vegas for the International Esthetics Cosmetics and Spa Conference (IECSC) at the end of June. I've been attending this show now for well over a decade. The size attracts a large number of vendors and more importantly, some of the best educators in our industry. My biggest takeaway from the conference this year? Technology! Yes, I came home with new gear. This handy little gadget allows me to quickly check the moisture levels in your skin using bio-impedance. For those struggling with dry skin and barrier damage, it's a way to measure real results post-treatment. I'm pretty excited about this one. LED stands for light emitting diode.This painless light therapy can be incorporated into treatments in a variety of ways. I'll be using red LED light therapy for anti-aging treatments, to stimulate collagen production, and minimize sun damage and fine lines and wrinkles. Blue LED light therapy is very antibacterial and great for acne treatments. Need both? Then I'll use a combination. I love that this technology has very few contraindications (only epilepsy and those using photosensitizing drugs) so I am able to use it in a wide variety of clients, including my clients undergoing treatment for cancer. If you'd like to hear more about this great technology, or have questions please let me know and I'm happy to go more in depth. I am already adding this technology to treatments, and in the next few weeks, will also add a series to my menu to intensify your results. I also fit in four lecture sessions, ranging from theories of aging to acne to pigmentation issues. As most of you already know, I love taking classes and being a student. I always learn something new or solidify knowledge on a topic. It's also a way to pick up new, more succinct ways to share information with all of you (always helpful). 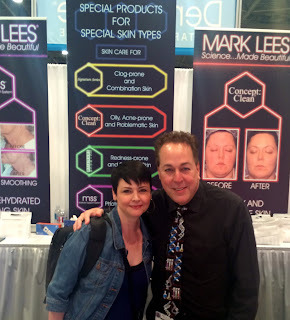 Here's a shot of me and industry legend Dr. Mark Lees, the man who wrote the book(s) on skin care and acne. Two of my lectures were with him and I also came home with a new salicylic acid peel from his line that is getting great results. And yes, I got a signed copy of his book, Clearing Concepts because I am a proud skin care geek! I love this conference. I always leave excited and motivated with a long list of topics to follow up on. All of you are top of mind during the lectures and demos. Client's initials are commonplace in the margins of my notes when I learn something applicable in my practice. I look forward to using some of my exciting new technology and products in your future appointments!